Intestinal ischemia is difficult to diagnose in a critically ill patient. Natural orifice transluminal peritoneoscopy may provide us with a valuable diagnostic tool that can be performed at the bedside with minimal equipment requirements with a potential for a high sensitivity in detecting ischemic bowel. The aim of this study is to develop a bowel ischemia model in pigs and evaluate the feasibility and accuracy of transgastric peritoneoscopy for detecting this condition. The investigative team was divided into two groups. One team created the model with mesenteric vessel ligation via laparotomy. The total bowel length was measured and up to three segments of small bowel were made ischemic. One control animal underwent laparotomy with no ischemic segments created. Following an ischemic period of two hours, the extent of ischemia was quantified as a percentage of the total bowel length and the laparotomy was closed. A second team who was blinded to the results of the initial surgery then performed transgastric peritoneoscopy using standard endoscopic equipment. All four quadrants were evaluated and the bowel manipulated with an endoscopic grasper. The endoscopic investigators recorded the presence or absence of bowel ischemia and estimated the percentage of small bowel involved. The gastrotomy was closed using Bard full thickness T-fasteners. The procedure was completed in six pigs. The mean operative time for the NOTES procedure was 74 minutes. Peritoneoscopy accurately diagnosed ischemia in all animals in which it was present. The endoscopic team reported no ischemic bowel findings in the control subject. The total percentage of intestinal ischemia estimated by peritoneoscopy (mean=20.8%) was similar to that measured at laparotomy (mean=17.8%, p=0.14). In two animals, the endoscopic evaluation underestimated the total number of ischemic segments present. Endoscopic evaluation of the right upper quadrant in this model proved to be the most technically challenging portion of the case. 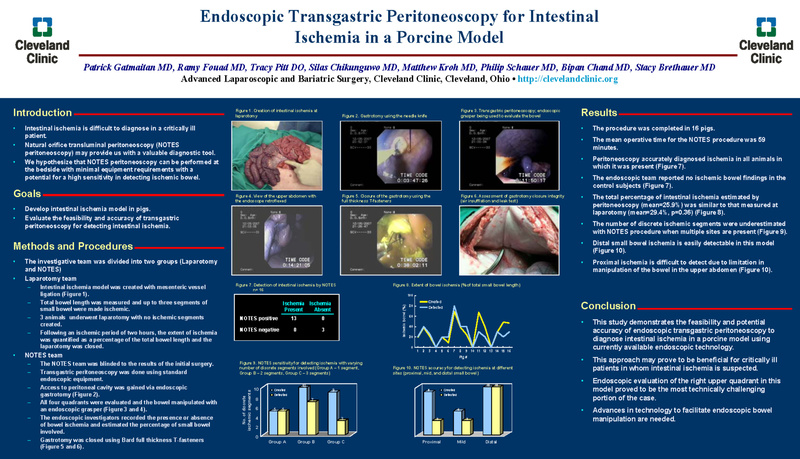 This study demonstrates the feasibility and potential accuracy of endoscopic transgastric peritoneoscopy to diagnose intestinal ischemia in a porcine model using currently available technology. This approach may prove to be beneficial for critically ill patients in whom intestinal ischemia is suspected. Advances in technology to facilitate endoscopic bowel manipulation are needed.